The Game is Complete! Demos now Available! Finally – the game is ready. It will be going on sale Sept 1st/2nd. We will post details here about where you can buy it. For now, here are the usual flavours of the demo. Please report any bugs to info@causalbitgames.com, Thanks! It has been a long road for a couple of guys working on a game in our spare time to make a game that plays how we want it to play. It came a long way from what it began as before the Kickstarter took off. Many ideas were discarded and some have made a return. Levels have been rebuilt several times. Graphics completely redrawn… two versions of the sound track available in game… It ended up being a much bigger game then what was intended. For a seasoned gamer it should take 2-3 hours to complete. For the average gamer, you will die a bit until you learn that the game is meant to be not so forgiving like modern games are. Many enemies will need timed attacks, you can’t just rush forward in certain situations. Tree men for example can not be thrown, they are too heavy. And their punch packs a death sentence. 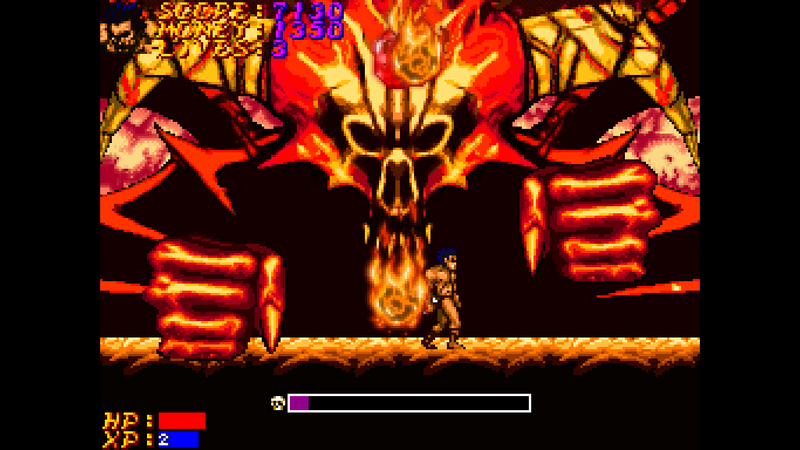 Some bosses have moves that can take away all your hit points in one shot. Watch for warning signs of attacks to avoid being hit. Taking your time in some places is the key to completing a stage. It’s a hard game and that’s what it’s meant to be – a challenge! It’s a real retro game. You will not float when you jump, you will die when you fall into a pit of spikes. And you don’t have unlimited continues! But like a modern game we have an automatic save as every level is completed. So you can take a break and come back later and pick it up again! We will also be doing a few big updates to the game. The promised arena modes and zombie surfing bonus games will be added in! As well as bug fixes as they pop up!